As one pulled into the parking lot of Fat Harold’s on Sunday, September 23rd at 1:00pm, there was already a crowd forming around the door and the tents outside. This crowd anxiously was waiting to see if their name was going to be drawn as the 2018 OD Shag Club Golf Cart Fundraiser winner. Inside Fat Harold’s the bar was open, and our own OD Shag Club DJ Gary Bass was spinning the tunes for those that wanted to get a “libation” (beverage) or wanted to check out the dancefloor. Fat Harold’s own bartender, Justin Rhia, was chosen to pull the winning ticket. After a few words of gratitude’s and shout outs for an outstanding response from volunteers, Jim and Monica Palmieri cut the tape on the box of tickets and poured them into a garbage bag to be tossed and turned and mixed up by Board of Director Billy Powell. Excitement was in the air as Justin reached way down into the bag and pulled out the winning name of our very own OD Shag Club member: Carolyn Stuckey!!!!! Disappointment was seen on the faces of those around who didn’t win but were glad that they could help support the OD Shag Club. President Linda Campbell dialed Carolyn’s number as Monica Palmieri prepared to let her know the good news…however, it went to voice mail…. ugh! Later Sunday evening Monica received a phone call back and Carolyn was more than excited to hear that she was actually the winner. Words aren’t enough to say THANK YOU to Jim and Monica Palmieri for an OUTSTANDING JOB!! They worked so hard, along with their volunteers and their goal was to sell all the tickets. All 3000 tickets were sold by Friday night at Fat Harold’s and Barbara Hopper bought the last ticket. This is a phenomenal job as there was 2 days during Spring Safari SOS that they didn’t get to sell tickets due to rain/wind storm that came and blew their tent away and one whole week of Fall Migration that they couldn’t sell tickets due to Hurricane Florence. Thank you to EVERYONE who bought a ticket and help to support the OD Shag Club! We are a strong club with wonderful members and friends who believe in our beloved dance and want to keep us all on the dance floor!!! Just in case you haven’t heard, we sold ticket # 3000, the very last ticket, on Friday night at Fat Harold’s. 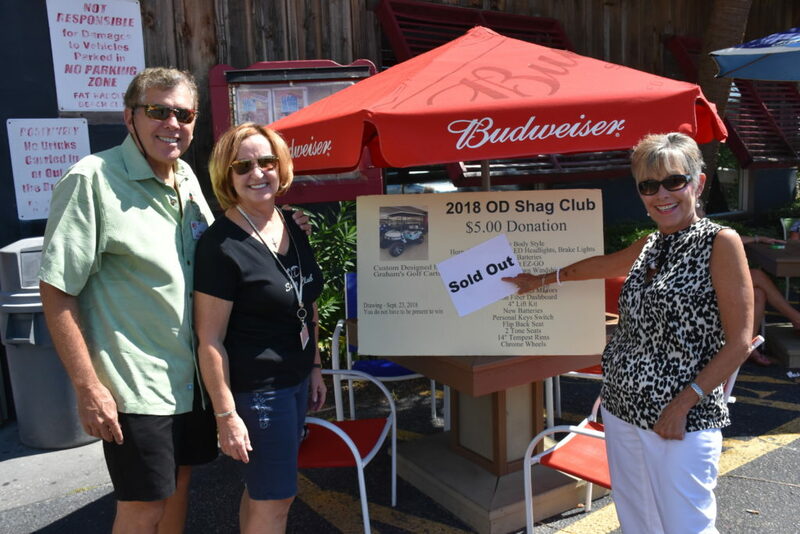 The winner of the OD Shag Club Golf Cart Raffle was selected at 1:00 p.m. yesterday at Fat Harold’s. The lucky winner is Carolyn Stuckey. Carolyn is an OD Shag Club member and golf cart ticket volunteer living in North Myrtle Beach. We want to thank each and every one of you for volunteering to sell tickets. Without you, we could never had made our goal of selling all 3000, which we hear is the first time all 3000 tickets were sold. 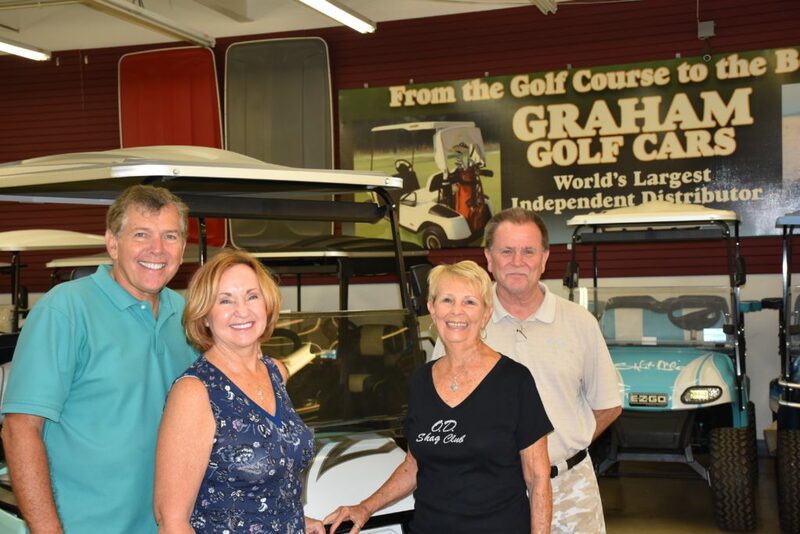 Also, thanks to Mike Graham of Graham’s Golf Carts. Mike stored the cart for us and sold over 300 tickets for us. We hope you enjoyed the time selling tickets, working with other members and making new friends. We certainly enjoyed working with each and every one of you. We are already thinking about 2019 and would welcome any recommendations you may have on how to improve communications and our sales efforts. Again, our deepest appreciation for volunteering.